Building Biology | Sunscreens – friend or foe? Sunscreens – friend or foe? 25 Jun Sunscreens – friend or foe? Oxybenzone an ingredient found in over 50% of sunscreens (and in the blood of 96% of the US population) can trigger allergic reactions, is a potential hormone disruptor and penetrates the skin in relatively large amounts with many experts now recommending that it should not be used on children (EWG, 2011). Despite the fact that more people use sunscreen than ever before, the rate of skin cancer continues to rise. Research conducted by the Environmental Working Group in 2011, revealed that the great majority of sunscreens do not protect against both UVA and UVB rays and in addition, may contain chemicals that affect our hormones, damage the skin and in some cases, actually increase the rate of skin cancer. There are essentially two types of sunscreens: mineral and non-mineral formulations or a combination of these. SPF above 50+. 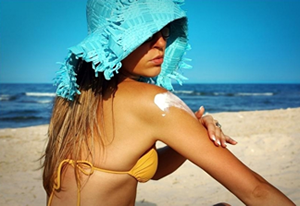 To read what’s wrong with high SPF, click here. Soleo Organics, Banana Boat Mineral Protect Sensitive and WOTNOT Sunscreen. Banana Boat Mineral Protect Sensitive. For a list of the best brands of sunscreens, click here. Don’t rely on sunscreens to do the job! Check the UV Index Level every day and avoid midday sun. Seek shade where ever possible. Dont go overboard – the sun is our greatest healer. We all need sun exposure to lift our mood (enhance serotonin) and activate Vitamin D in our skin. Early morning and late afternoon sun is vital to our mental and physical health. Click here to find out the UV Index level today. Get the UV Skin Cancer Alert Card. Download the free UV Alert SunSmart ap. Friends of the Earth. Safe Sunscreen Guide.Summer 2011-2012.
International Agency for Research on Cancer. 2001. IARC Handbooks of Cancer Prevention, Vol 5, Sunscreens. Lyon: IARC Press. National Toxicology Program. 2009. Pathology Tables, Survival and Growth Curves from NTP Long-Term Studies. TR-568 All-trans-retinyl palmitate. National Toxicology Program. Available: http://ntp.niehs.nih.gov/index.cfm?objectid=555571BB-F1F6-975E-76F2BC5E369EB6F7.